Graphline is a graphical WaSiM help tool which is offered as shareware. 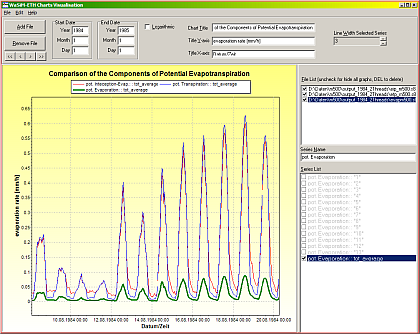 It can be used for displaying input and output data using the WaSiM time series format. Graphlines can display even large result files very fast compared to other professional graphing software. No complex projects for converting WaSiM results into other data formats are required - simply load the files and select the desired series. Graphlines uses a mouse optimized zoom function which works smoothly and allows a fast navigation through long time series. The number and size of time series which can be visualized in one chart is virtually unlimited. Every time series graph can be customized with respect to line thickness and color. Further information can be found in the programs manual (still in German only).